As you read this, I’ll be joining a couple hundred friends and family in Louisiana to congratulate CAPT John Cousins on a long and spectacular career. John is one of those guys you envy. He has wit, he has a quick mind, and he is very, very good at what he does. It just doesn’t seem fair to us mortals. 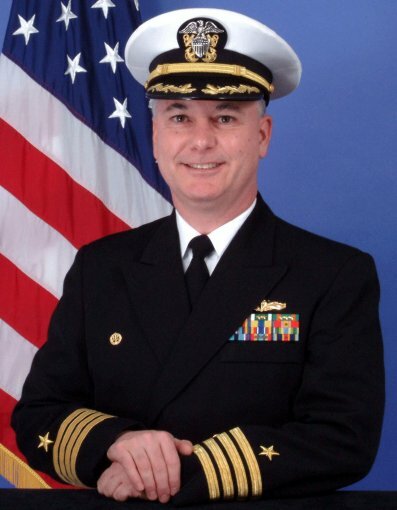 He is an Oceanographer and at one time headed the largest Oceanography command in the Navy. He is combat tested. But what he will always be known for is his reputation for taking the tough jobs – the ones everyone else ran from because they were too hard – and coming through time after time. And he did it with enthusiasm and a never-ending sense of humor. The Navy is losing a great officer today, but thousands of us who had the privilege of working with him are better for having known him. John, as you walk through those bullets today, do so knowing you made a difference. Fair winds and following seas, shipmate. You are our hero of the week. I served with John on C7F staff. He is a great guy and shipmate. I was also able to work for him for a short time at NAVO. The Navy is losing a good guy today. Hope to see you at the ceremony Jeff.